My passion for health and wellness has been inspired by my personal journey. Chiropractic is my life; I’m always treating clients someway, somewhere. As a youth in Canada, Gale Zappacosta was injured in a motocross accident, exacerbating long-standing problems with severe lower back pain, daily headaches and chronic cyclical tonsillitis. Her subsequent discovery and experience of chiropractic care led not just to her recovery, but a life-long commitment to health care. 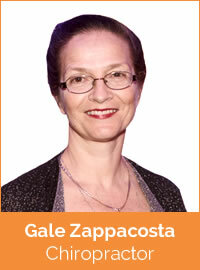 Gale began her chiropractic studies in Toronto, Canada at the Canadian Memorial Chiropractic College in 1978. She graduated as a Doctor of Chiropractic in 1982 and has since set up and run sports injury and family clinics in both Canada and the UK. Gale has a unique and extensive professional history, described in part in the wide range of clinical qualifications detailed below. This experience has inspired both the establishment of this multi-disciplinary clinic at Irrefutable Health, and its partnerships with The Willow and BlueSky Connexions. Gale is married with three children and several grandchildren.